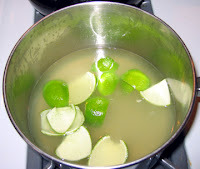 As a companion to my article on The Spirit World (should be up shortly), I wanted to put a more detailed piece about homemade lime cordial on my blog. 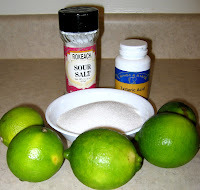 Awhile back, I wrote about the Gimlet and whether it must be made with Rose's Lime Juice. 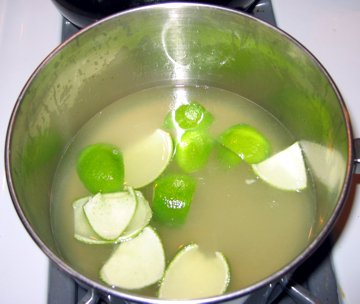 At that time, I stumbled on a recipe for homemade lime cordial on Wikipedia. For the last few weeks, I've been playing around with the recipe, and think I've (finally) got something. The original recipe was too sweet, and did not have enough lime. So I tinkered (and tinkered and tinkered). First, the ingredients. The recipe started with weights, but I have converted them to volume equivalents. Tartaric Acid (also granular, also derived from fruit, tougher to find, although you can get it at homebrewing stores and winemaking supply shops). Just FYI, cream of tartar is a derivative of tartaric acid, so originally I tried to make the cordial with cream of tartar instead. Never quite got it to be acidic enough, it was always too sweet. So I broke down and hunted down the tartaric acid. Stir sugar, citric acid and tartaric acid together with a whisk. Bring water to a boil, then add sugar mixture. Stir thoroughly to dissolve sugar mixture into water. Add lime juice and rind, and stir. Heat mixture for 1-2 minutes on high heat, then cover and cool to room temperature. 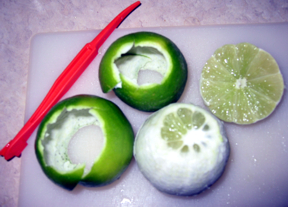 Refrigerate overnight in a sealed container, then strain out lime rind. Refrigerate for another day before using (the flavor continues to change a bit). Stored in the refrigerator, it should keep better than simple syrup. Other Variations If you want it to be more tart, you can up the acids and/or reduce the sugar. Its also delicious made with lemon rather than lime. I particularly like a gimlet made with lemon cordial, with a gin that has lemon peel in its flavor profile. Hi Todd, thanks for the comment. I agree, and I made some subsequent batches with more lime and liked them more. I just never posted an update here! 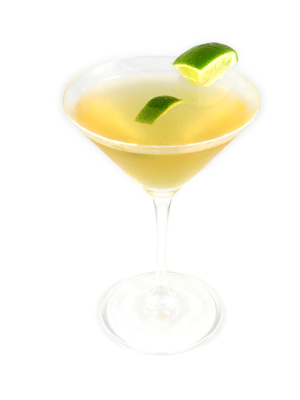 It is gimlet season, so perhaps I'll have to have another go. Do let me know if you have a recipe you love! Is the Gin Market Flat?